If you wish to contact us by email please click here, or alternatively you can call us on: 0203 905 5553. There multiple statuses for your order depending which stage it is at. Below is a list of the statuses you will see when checking your order's progress. Processing Order - Your order is being worked upon by the dispatch team - Our Customer Service Team will contact you within 24 hours to notify you of any issues. Check you have received an order confirmation and a dispatch confirmation email from us. Check the tracking link via your dispatch confirmation email to view the most up to date information on the whereabouts of your parcel. Check for text messages, emails and attempted delivery cards from one of our couriers. Your parcel may be awaiting collection at a local delivery depot or you may need to re-arrange delivery. Check no one else residing at your address has taken receipt of your parcel. If you still can't locate your parcel then please contact our Customer Services team via email at sales@stuartslondon.com or via telephone on +44 (0)203 905 5552 with your order number to hand. We will endeavour to find your parcel straight away. All of our shipments are insured to the necessary value, so should it not be found we will arrange a replacement or refund for you. We are happy to change or cancel orders in accordance with the Distance Selling regulations. If your order has been placed, but not dispatched, we will make the change or cancellation straight away if possible. When changing the ordered items please call us or email us as soon as possible so we can amend the order. If we have already dispatched the order, then we will have to wait until you return the items back to us treat it as an exchange. More information on making a return can be found within our returns policy Click Here. Please note if the cancelled item is already on the way to you via a courier and you have notified us in accordance to the Distance selling regulations, we request you send our goods back before we can refund you. You are in full right to a refund of the product, but we are also in the right to charge a postage and packaging fee of our "costs incurred". If you are cancelling your purchase you can aslo opt to not accepting it from the courier as it will make it's way back to us. However there is no set time on how long it takes, so if you need a quick refund on your cancellation then accept the parcel and arrange your own suitable method of return. Please call us prior to returning back the package, incase we can organise a collection for the Cancelled order. If there is an issue with your order when you receive it please contact out Customer Service Team via email at sales@stuartslondon.com or via phone on +44(0)203 905 5552 who as soon as possible. We will do our best to resolve this issue as quickly as we can. Yes, if you're shipping destination is a non EU destination then our prices already have VAT removed. Please click here to see full duties and Tax information for orders going to the US. *Please note we are not able to 'de-value' any invoices or mark as 'gift' in order to help you avoid your countries Custom's and Duty charges. My item bought is now on sale what's your policy on this? If in an unfortunate circumstance your purchased item falls in to our sale or any promotional** offer within 5 working days of your purchase date we will refund the difference by placing funds into your Stuarts London e-wallet in your account to use at your convienece. We reserve the right to reduce the prices on any of our products without any prior notice. **PLEASE NOTE WE DO NOT WORK THIS POLICY FOR OUR SEASONAL MAJOR SALES HELD ON THE WEBSITE OR INSTORE DURING THE WINTER SALE HELD FROM BOXING DAY 26TH DEC OR THE SUMMER SALE WHICH IS HELD FROM LAST WEEK OF JULY. You haven't replied to my query? We try to respond to any queries as quickly as possible, however sometimes there may be delays. As a small independent company we occasionally receive multiple queries at peak times. In such instances we are still trying to provide all our customers the best possible service, but it may take more time. We ask for your patience, but we appreciate how frustrating it can be to have to wait for a response. If you email us again we will give you a call back to address any problems and update you on the progress of your enquiry. What courier do you use for deliveries? We use Priority FED EX to send all our orders to the USA. 1-3 Working days Service. Delivery is dependent on the availability and we reserve the right to use third party courier in order to get your parcel to you on time should this be necessary. If you would like more information on the type of courier we are going to use for your destination please contact customer services on Tel: +44208 735 1801 prior to us sending your parcel. Please note we offer a Free Delivery Service in the UK and most Worldwide destinations when you spend a certain amount to qualify for Free Delivery. Please note Terms and Conditions apply to Free Delivery when requesting a refund please be sure to read our returns policy. On orders placed before 4pm we guarantee the item(s) will be dispatched the same day. Orders to USA will be sent via Fed Ex Priority Service. Delivery is expected to tale 1-3 working days depending on location in USA. All parcels can be tracked and a tracking number will be emailed to every customer after an order has been dispatched. Yes, all deliveries are traceable. Your tracking number can be found in your account area under "order history". Also a copy of your tracking number is will always emailed after items have been dispatched. Please also check your junk mail in case the email as filtered its self in to the that folder. Courier tracking numbers are only active and traceable 2-4 hours after the order have been dispatched from our warehouse. Collections happen approximately 4pm Mon-Fri. Saturday collection is approx 12pm. If you place your order AFTER 4pm on a Friday, your order will not be traceable until it has been collected from us, which is usually the next working day. All orders placed before 4.00pm (GMT) will be shipped that day, dependent on payment and stock availability. You will receive a dispatch confirmation via email, sent to the email address on your online account or used at purchase. Also a copy of your tracking number will be in order history in your accounts area. If Royal Mail are unable to obtain a signature from somebody at the address then your parcel will be returned to your nearest Royal Mail depot. Royal Mail will leave a card at the delivery address, which will have instructions of re-delivery or collection. If a FED EX shipment can not be delivered, a card will be left and the courier will attempt re-delivery on the following working day. Following this, if delivery is still unsuccessful a card will be left and the goods returned to the depot, from here a collection or re-delivery can be arranged. Royal Mail Special Delivery and FED EX requires somebody at the delivery address to sign for the package, it does not have to be the addressee. The signature is electronically logged for security. Any signature at the address will be taken as proof of delivery by us. However once a delivery is obtained at the address we cannot be held liable for packages misplaced or lost after the signature is recorded. Please make sure your select an address that you consider safe for delivery if you are unable to sign in person. Please note: If you are using a work address to receive your parcel , this will be at your own risk. We will not be liable to deliver to a work address that may result in letting a front desk manager sign for your parcel. Please make sure your work address is secure before requesting this address for delivery. We can ship to BFPO addresses, please ensure you complete the billing address field as appropriate and the BFPO address as the delivery address. We deliver to most countries worldwide, your postage rate will be calculated at the checkout when you finish your order. Delivery times vary depend on location, feel free to contact us for additional information on International orders. Some Countries are not listed on our site due to the delivery rate being high. Please call us on 0044 (0) 208 735 1801 so we can quote you the price of delivery tou your country. Any customs or import duties are charged once the parcel reaches it's destination country. These charges must be paid by the recipient of the parcel. On orders placed online we provide the option to ship to a different address than the one at which your card is registered. For security reasons, this service is discretionary, and we reserve the right to only ship to the billing address, or verify details with our customers before shipping to a different address. If you have made a mistake with your delivery details contact us immediately and we can try to amend them. Orders placed over the telephone must be shipped to the billing address. If the order has already left our office, then the delivery address cannot be changed. Usually all first time orders are only shipped to the billing address. Can I collect my item from your store? Yes, please contact us via phone on +44(0)208 735 1801 to arrange a store collection. Please print off, and bring along your order confirmation, as we will require this as proof of purchase, valid identity, Credit Card used to make purchase and any Utility Bill with address that matched order confirmation. We do know this is a lot to ask for, but we need to protect our customers from potential fraud. Your postage will be refunded upon collection if incurred. "RETURNED GOODS: GB MERCHANDISE FOR REFUND "
"RETURNED GOODS: GB MERCHANDISE FOR EXCHANGE "
Also please highlight this to the Courier you are using so they correctly fill out the paperwork on your behalf to make sure you avoid any charges and problems with UK customs. Please download a returns form from the link. This Courier companies automatically charge customs and duty on every parcel returned back to the UK. To avoid this additional cost as we are not importing goods and only receiving back a product we sent out from the UK , please use alternative postal service. Additional charges that we incur may be charged back to sender. Also please highlight to any Courier you are using , that you are making a return for exchange or refund , so they correctly fill out the paperwork on your behalf to make sure you avoid any charges and problems with UK customs. We do not deal with packages held at customs on behalf of the sender. We want the returned package to reach our given returns address and do not offer to pay any customs charges on your behalf if your parcel is stopped at the UK border because procedure was not followed correctly. If you decide once you receive the item that it is not as described or simply not to your liking we offer a full return and refund policy. Please return using recorded delivery postage or any courier of your choice as this will allow you to track your parcel back to us, as we are not liable for any missing/damaged parcels sent back to us. Electrical items, cannot be exchanged or returned if the original packaging and plastic wrapping seals are broken. Bang & Olufsen Products - are all covered with a special company warranty on faulty items only. DO NOT REMOVE ANY ORIGINAL SWING TAGS, LABELS OR DAMAGE THE PACKAGING AS THIS WILL VOID ANY RIGHTS TO REFUND OR EXCHANGE. PLEASE NOTE, Items being returned from outside EU must be CLEARLY MARKED on the customs form & Outside of the package " EXCHANGES" or "REFUND". Any items of clothing returned with the smell of perfume or cologne will not be accepted. Sale items are NOT refundable, and can only be exchanged or a credit-note as an e-voucher will be issued against the purchase. Please note that if any item is bought on the website and goes into sale within 5 days of purchase we will refund the difference by e-wallet in your Stuarts London Account. We have the right to reduce prices or place items into promotional sale without any prior notice. Returns will not be accepted on worn or misused goods. All original labels must be in tact. Any items we receive without authorization form will be sent back at a cost to you. If you are returning an item for an exchange we will cover costs for sending the replacement item back to you Free of charge within the UK. Free Exchanges within the UK will be offered within reason, 1st time exchange will not be charged, but we reserve the right to request a delivery fee if we need to exchange the same item(s) multiple times. We are sorry that we cannot offer free exchanges to destinations outside the UK. We do not reimburse the cost of you returning the item to us. However in cases where the product is faulty due to manufacturing or any mistake made by us, we will refund you in full including any costs incurred to you within reason and once we validate your claim. Any Delivery charges we reimburse will be limited to a value of no more than our own suggested delivery rates. For your convenience our returns form includes some key points from our returns policy but not all, so please read the returns policy in full carefully on the website so you don't encounter any surprises, you are unaware of, when making a return. 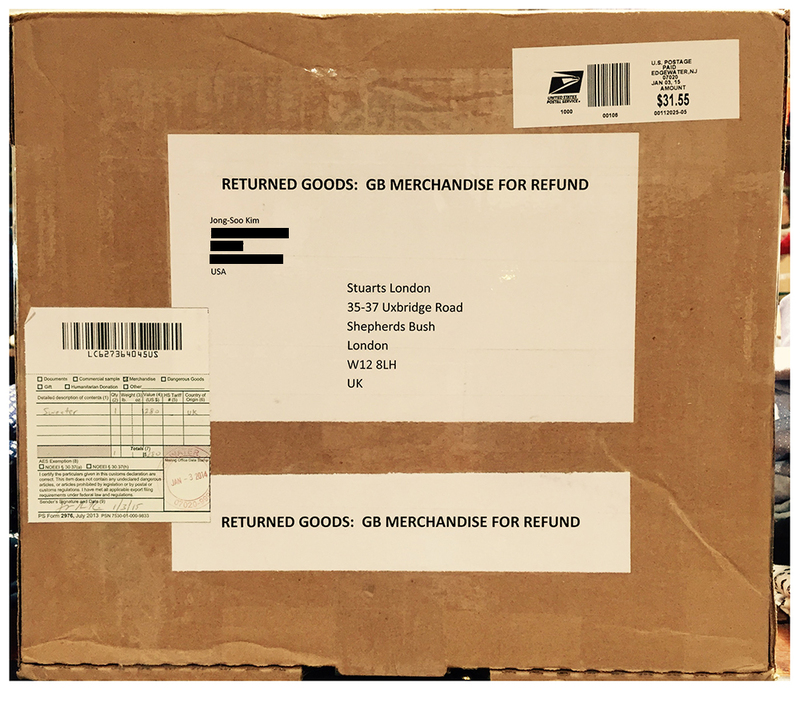 We request the ordered item be returned back to us within 14 days from receipt of the item to exercise right to return when requesting a Refund or 28 days is given if you would like to exchange or receive a e-voucher. We will try to handle your return as quickly as possible, and you will be notified by email when the return has been processed. We recommend that to make a note of the shipping reference provided to you when you send the items back. This will allow you to track your parcel at every stage of delivery, including when we receive it. However, please feel free to call us on +44(0)208 735 1801 and check if we have received your return. We aim to process any returns within 1-2 working days of receiving them. How long will it be before I get a refund? As long as the returned items meet our refunds criteria, your refund will be with you 2-4 working days after your return is processed, this is also depending on your card issuer speed to return back funds to your account. Peek times such as during 'Sale' or 'Xmas' may take a max of 5 working days. After your return has been processed, as long as we have the exchange items on stock you should receive them within 3 working days. The overall expected time for an exchange can be up to 7 working days from us receiving the item. I have been refunded less than I was expecting? In some cases we reserve the right to apply a restocking and handling fee, to cover bank charges or postage and packaging. Please refer to our Terms and Conditions for full details. In most cases we usually waiver this cost, but in cases when an item is specially ordered in on a "customer request" and then returned for a refund, additional charges may apply. Return an item from outside the EU? Please be sure to mark the Package Clearly "Product returned for Refund" or "Product returned for Exchange" on the outside of the Package before sending back. If you are returning an item for an exchange we will cover costs for sending the replacement item back to you Free of charge within the UK only. We are sorry that we cannot offer free exchanges to destinations outside the UK. Free Exchanges within the UK will be offered within reason, 1st time exchange will not be charged, but we reserve the right to request a delivery fee if we need to exchange the same item more than once. We do not reimburse the cost of you returning the item to us. However in cases where the product is faulty due to manufacturing or any mistake made by us, we will refund you in full including any costs incurred to you within reason. Please note that you should return faulty/incorrect items using 1st Class postage - Recorded Delivery. We cannot refund the costs for express or next day delivery and if you choose to send the item(s) in this way we will refund a standard £3.95 only. You will be required to pay and organise your own method of getting the products back to us securely. We do not refund your cost of delivery. In cases when requesting a refund, you may be charged a delivery contribution , this only applies to orders where we originally paid the courier and but gave you a free delivery because you spent over the qualifying amount. However that 'Free Delivery' becomes void when requesting a refund. Charges deducted will be calculated on our cost as displayed on the delivery rates page for your country. Exchanges will be charged as per normal delivery rate and we are sorry we cannot offer free exchanges to international customers. Who pay for my return postage if my item is faulty? Please note that you should return faulty/incorrect items using 1st Class postage - Recorded Delivery. Unfortunately we cannot return the original Postage & Packaging charges paid by you or by us if you require a refund, so all refunds are MINUS this amount. The postage charge is a separate service that is completed. We do not profit from postage and keep our prices realistic to what the couriers charge us. Some orders that qualify for a free delivery can only be extended to customers wishing to keep or exchange the product. In the case of a refund the free delivery becomes void and a postage and packaging charge at a standard £3.95 will be deducted before a refund is issued. *Please note: Free Shipping can only be extended to those wishing to keep their purchase. If you are requesting a refund when returning your order the free shipping offer will become void and we have the right to deduct our initial delivery cost incurred. This does not apply to refunds being requested on orders that are being returned where you have bought multiple items and are only returning part of your order which holds a value that still qualifies for a Free Delivery. (UK orders will be charged at £3.95 and International orders will be charged at the cost of service as stated onthe website for your destination). Telephone lines are open 10am - 6pm Monday to saturday only. Skinny Fit - A very tight fit item which will suit someone who is slim build looking for an extra fitted look from the clothing. Tailored Fit - Similar to a regular fit but will be tailored around the sides or back to show off a shape suited for the muscular builds. Usually termed with blazers and shirts. Regular Fit - This will be a looser fit item with a less shapely look. Suited for any person who doesn't like clothes too close to the body and likes extra room to move in his clothes. Loose Fit -This will be a very baggy item that comes over sized than the size suggested. For example if the label states Medium it will fit more like one size up. Suited for those who like an oversized look from their clothing or may need a baggy fit for maximum room. Are all your products genuine? Yes, we are licensed stockists of all our products, and they are ALL 100% authentic. Can I get more information on a Product? If you require any additional information on any of the products on our website please email, or call our web team on +44(0)208 735 1801 and they will try to provide you with all the information you require. Do you have more sizes available? With products selling very quickly online and in-store we cannot always keep up with every product that is sold or returned. Occasionally a new delivery or return may come in and not be put back into online stock straight away. If a size is not shown on a new item, please email, or call our web team on +44(0)208 735 1801 and they will be happy to help. Please also note that when a product is out of stock, simply click the size and colour desired on the product page, and a text promt will appear. By clicking this the website will ask if you would like to be emailed when the item comes back into stock. Unfortunately it is very difficult for us to know if and when something will go into sale. As a result if something does go down in price after you have purchased it, we are unable to refund the difference. However we also like to keep our customers happy so if there is a price difference due to sale or a promotion with in 5 working days of your purchase, we will refund the difference as a credit note to your e-wallet on your request. Will you be getting more? Due to the limited nature of some of the products we stock we can often sell out very quickly. We do Sometimes re-stock of classic or popular items, and if you would like to ask about a product, size or colour that is not shown, please email, or call our web team on +44(0)208 735 1801 and they will be happy to help. Please note by clicking the size and colour on any product that are showing out of stock, this will promt the website to ask you if you need to be emailed back if and when the products come back into stock. Yes, we accept valid Stuarts London Gift vouchers, both online and in-store. Online gift codes are only accepted for online orders, and store gift vouchers are only accepted in our retail store. We do not accept any Gift Vouchers other than our own official Stuarts London vouchers. If you have an account with us at Stuarts London and would like to use your loyality e-wallet balance in store please let us know before hand so we can authenticate your account, please bring valid ID in order to do this. Yes, we use industry standard SSL encryption to protect your details. Potentially sensitive information such as your address, name and card details are encoded and encripted so they can only be read on the secure server. This information is authenticated to ensure it only gets sent to this secure server and is checked to make sure it has not been tampered with during transfer. Security checks are also made on all payment, to ensure the authenticity of each card payment. No creditcard details are stored on the website but simply passed on to the bank at time of purchase. Due to the nature of our payments system, the full cost of the order will be charged to the card as soon as the order is placed. We currently accept - American Express , Mastercard, VISA, Solo, Switch / Maestro, Visa Debit, Delta and Electron for payments online. Searching for products on our website couldn't be easier with the filters we have on each page. Whislt browsing departments , you will notice there are many filters that can be used, for example if you want to select a shoe by colour, size and style this is possible as would be the same with , searching for a shirt in a particular colour and style, and size. Simply select by checking the box next to each filter and then click apply. If we have what you want in stock it will display automatically. A more general search function is also avilable on the site also on the top right, where you can enter a keyword relating to your enquiry and the system will automatically display suggestions. If your having problems with the website, we have tech guys who can help fix matters. Please contact us and let us know if you see something not functioning as it should. We do try our best to test every aspect of our website but sometimes new issues can arise caused by a software update that we will not be aware of unless we are alerted. Please note if you are trying to make a payment using your e-wallet and Paypal, you may not be able to complete your order. As Paypal Payment gateway does not support our E-wallet functionality. Please contact us via email customerservices@stuartslondon.com or the Contact Us link at the bottom of the website. Here at Stuarts London we offer a unique member benefits area to our loyal customers. By offering member points incentives for the ways you interact with Stuarts London you can elevate your member status over time from Basic to Gold Member status. We offer points not only for any orders you place but for simple things like telling us a little more about you to introducing Stuarts London to your friends and many more ways. The more points you earn - the more you save! CLICK HERE to read more on ways to earn points on Stuarts London. PLEASE NOTE - Apart from the sign up points you receive when completing your profile all other points are set to Expire within a certain time. To maintain your tier level reached , you will need to add more points with purchases made. Remember a good way to top points are to write a review on products you have bought in the past. This can be done from your own accounts area when you log in. * Stuarts London Reserves the right to remove any points that are given incorrectly or not in accordance to our terms and conditions. Where does Stuarts London trade from? Please note: We are usually closed on Bank-Holidays. Please phone before making a journey down on any national holiday to find out if we are open. Everything we have online will be available in store too, please ask a member of staff if you don't see what you wanted. No, but you are able to keep up to date on the website. We are currently working on getting a hardcopy ready which will include some of our brands. As stock levels change every day and new arrivals are recieved everyday the website is the best way to view up to date collections. No, as a retail operation we do not wholesale any of our brands stocked. Can I contact you over the phone? Yes, please call us on +44(0)208 735 1801 any time between 10am-6pm GMT Mon-Sat, we do sometimes experience a high volume of calls, as such please be patient if you can not get through straight away. Your call is important so please do leave a message on the switchboard. An operator will get the right person to call back to answer any question. What email address should I use to contact you? CustomerServices@stuartslondon.com is the email contact to use. This address is dedicated to queries regarding orders and purchases and will allow us to answer your questions as quickly as possible. We aim to answer all email within an hour of business working time. Alternatively we have a online Customer Service ticket system - this is a quick respose area and is updated throughout the day.